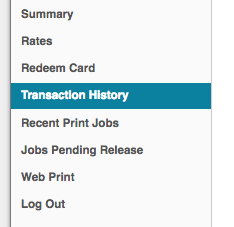 MCECS users can use PaperCut (https://print.cecs.pdx.edu/user) to view a summary of your balance, number of jobs printed, and total pages printed, a chart tracking your monetary printing history, and a little chart of the environmental impact of your printing. 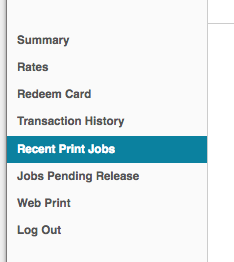 Enables you to view your print history. This is useful to see which printers you used, how many pages were printed, and (for printers with quotas) how much you were charged for the print job. Gives a brief summary of the day of the money transaction, the type of money transaction, such as print job, etc.